Ashley is getting better. Her fever has subsided after 2 days. Had no choice but to give her a 3-day antibiotics. She still has runny nose and cough though. Ashley has been throwing up each time she takes her milk or food because the phlegm irritates her. It’s hard to see her throwing up all the time 🙁 Since she doesn’t want to take her medication, I put all the mixtures in her milk. So each time she throws up, I start to worry about how much medication has entered her body. This morning when she woke up, she saw a picture of a duck on her sweater. Then she said “quack quack quack” and started to flap her arms, imitating the duck while jumping on the bed. I’m glad to see that as it means she IS getting better 😀 (No, I didn’t manage to take a photo or video of her doing that). My little girl is sick. She has fever, cough and cold. 3 in 1. Sigh…We took her to the paed yesterday evening and it was nightmare for her. She is so paranoid about seeing a doctor ever since her eye surgery. When we arrived at the clinic, the paed was not in yet and we were number 3 on the list. Hubby took her for a walk around that area so that she didn’t need to stay too long inside the clinic. When it was almost her turn, I asked hubby to bring her in and she was ok for a while when she saw the slides and the toys. As soon as the nurse called her name, she started to run away and cried. Had to grab her and took her inside. While the doctor was checking her, she screamed and kicked 🙁 It was over in 5 minutes and I had to send her out to hubby who was waiting outside so that I could talk to the paed. Every trip to the clinic is really stressful for all of us. Getting her to take her medication is very difficult now. Her fever came back around 4am this morning and I had to force feed her the medicine while hubby held her down. Now Ashley’s voice is like an old woman. Luckily she is pretty active eventhough she’s not well. There were so many sick kids at the clinic. It must be the weather. Hope my baby will get well soon. From the title, I’m sure you know what I’m going to talk about 🙂 Does anyone buy Pampers Comfort for their children? I have a problem with this diaper and would like to know if anyone else faces this problem. Recently, I left a comment in Mom2Ashley post about my daughter taking off her diaper and running around b*ttnaked. I thought she’s ready to be potty trained 😀 Silly me! Now I know why. The top part of the diaper scratches her tummy and she feels so uncomfortable wearing it. Also, the sticky tape does not hold properly. Ashley uses 5 pieces of diapers everyday. Huggies during the day and Mamypoko when she goes to bed at night. I normally change her diaper every 3 to 3 1/2 hours. However, after she has her dinner and just before she goes to bed, which is about 2 hours apart, I let her use Pampers Comfort as it’s cheaper than the 2 brands mentioned. It cost about RM28 for 72 pieces of Large size. I still have half a bag to go and for sure I’m not going to buy this brand again. Any recommendations on what is good and economical? Also, last but not least, my sisters and my good friend, WP, who are not bloggers ;). So, if you see your name up there, please do this tag, alright? Please, please? Hey, the above names don’t mean that other mommies don’t read my blog. Just that I want to save some names for my other tag which is coming up soon. MUAHAHAHAHA!!! See what I got from my grandpapa ………..
Yayyyy….It comes with 2 baskets and mommy said I can put Barney and Babybop in them and they can ride with me. I guess for now, I’ll just take my balloon for a ride. My mom dropped by today for a visit and after Ashley has taken her bath, she took her to the playground at our condo. 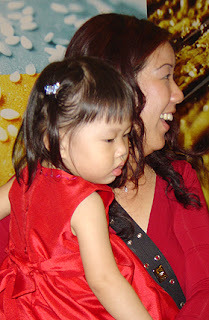 When my mom reached the playground, she saw a lady playing with her grandson who is about Ashley’s age. My mom walked over to the slides as Ashley wanted to play with it. Suddenly, this lady walked over and said, “Aiyo….your grandchild is STILL wearing diapers ah?” “You haven’t potty trained her yet?” “I trained my grandson when he was 4 months old“. Of course, my mother was taken aback because she doesn’t know this woman and she had the nerve to walk over and make comments like that. My mother just ignored her and continue playing with Ashley. After seeing no response from my mother, she walked away with her grandson. If I happened to be there, of course I would tell her off. I just can’t stand people like that. Damn annoying! Woo hoo, my Munchkin is Two!!! Oppss…..must quickly post this up now because some of the guests already posted about this party * very embarrassed*. 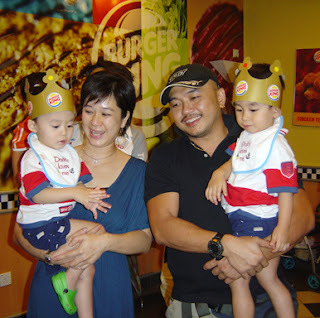 The big birthday bash was held on 19th May, 2007 at Burger King, Mutiara Damansara. Kylie, Fearles, Cruz and Ashley turned 2 years old in May. The party was attended by many mommies, daddies and their children. It’s great to meet up with everyone. I’m sorry I didn’t get to have a good chat with everyone. Hope all of you enjoyed the burgers, fries and drinks…..oh, and the cakes too. More posts on the bash at Allyfeel, Jazzmint, Sasha, Mott and Tracy. Thanks everyone for making this party so memorable and fun!!! thank you for coming to kylie, fearles, cruz and my birthday bash yesterday. i hope you all enjoyed yourselves. oh yes, thank you very much for the pressies. i love them! thank you also for coming to our birthday party. i’m sorry i didn’t play with you because i just can’t stop running around and playing with the stools. my yee-yees and por-por said they were very tired chasing after me. hehehehe. i hope all of you had a fun time too. mommy said she’ll post the photos of the party later, okie dokie? I have just been double tagged by Nadia & Sasha on this. Actually I didn’t give much thought to the meaning of Ashley. I just like the name and hubby said ok, as long as his mother knows how to pronounce it! I googled it and found that the name in Old English means Ash-Tree Meadow or Ash Wood. It was more popular for boys but in the recent years, more girls are named Ashley. **Start Copy**Proposition: What is the meaning of your kid’s name?Requirements: write about what or how or why you giving the name to your kids.Quantity: FIVE PEOPLE.